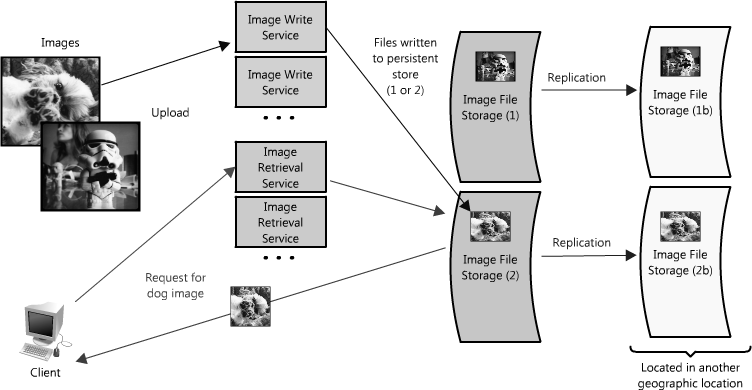 In our image server example, it is possible that the single file server used to store images could be replaced by multiple file servers, each containing its own unique set of images. (See Figure 4.) Such an architecture would allow the system to fill each file server with images, adding additional servers as the disks become full. The design would require a naming scheme that tied an image's filename to the server containing it. An image's name could be formed from a consistent hashing scheme mapped across the servers. Or alternatively, each image could be assigned an incremental ID, so that when a client makes a request for an image, the image retrieval service only needs to maintain the range of IDs that are mapped to each of the servers (like an index). Of course there are challenges distributing data or functionality across multiple servers. One of the key issues is data locality; in distributed systems the closer the data to the operation or point of computation, the better the performance of the system. Therefore it is potentially problematic to have data spread across multiple servers, as any time it is needed it may not be local, forcing the servers to perform a costly fetch of the required information across the network. Another potential issue comes in the form of inconsistency. When there are different services reading and writing from a shared resource, potentially another service or data store, there is the chance for race conditions — where some data is supposed to be updated, but the read happens prior to the update — and in those cases the data is inconsistent. For example, in the image hosting scenario, a race condition could occur if one client sent a request to update the dog image with a new title, changing it from "Dog" to "Gizmo", but at the same time another client was reading the image. In that circumstance it is unclear which title, "Dog" or "Gizmo", would be the one received by the second client. There are certainly some obstacles associated with partitioning data, but partitioning allows each problem to be split — by data, load, usage patterns, etc. — into manageable chunks. This can help with scalability and manageability, but is not without risk. There are lots of ways to mitigate risk and handle failures; however, in the interest of brevity they are not covered in this article. If you are interested in reading more, you can check out my blog post on fault tolerance and monitoring. Having covered some of the core considerations in designing distributed systems, let's now talk about the hard part: scaling access to the data. Most simple Web applications, for example, LAMP stack applications, look something like Figure 5. As they grow, there are two main challenges: scaling access to the app server and to the database. In a highly scalable application design, the app (or Web) server is typically minimized and often embodies a shared-nothing architecture. This makes the app server layer of the system horizontally scalable. As a result of this design, the heavy lifting is pushed down the stack to the database server and supporting services; it's at this layer where the real scaling and performance challenges come into play. The rest of this article is devoted to some of the more common strategies and methods for making these types of services fast and scalable by providing fast access to data. Most systems can be oversimplified to Figure 6. This is a great place to start. If you have a lot of data, you want fast and easy access, like keeping a stash of candy in the top drawer of your desk. Though overly simplified, the previous statement hints at two hard problems: scalability of storage and fast access of data. For the sake of this example, let's assume you have many terabytes (TB) of data and you want to allow users to access small portions of that data at random. (See Figure 7.) This is similar to locating an image file somewhere on the file server in the image application example. This is particularly challenging because it can be very costly to load TBs of data into memory; this directly translates to disk IO. Reading from disk is many times slower than from memory — memory access is as fast as Chuck Norris, whereas disk access is slower than the line at the DMV. This speed difference really adds up for large data sets; in real numbers memory access is as little as 6 times faster for sequential reads, or 100,000 times faster for random reads, than reading from disk (see The Pathologies of Big Data). Moreover, even with unique IDs, solving the problem of knowing where to find that little bit of data can be an arduous task. It's like trying to get that last Jolly Rancher from your candy stash without looking. Thankfully there are many options that you can employ to make this easier; four of the more important ones are caches, proxies, indexes and load balancers. The rest of this article discusses how each of these concepts can be used to make data access a lot faster. Caches take advantage of the locality of reference principle: recently requested data is likely to be requested again. They are used in almost every layer of computing: hardware, operating systems, Web browsers, Web applications and more. A cache is like short-term memory: it has a limited amount of space, but is typically faster than the original data source and contains the most recently accessed items. Caches can exist at all levels in architecture, but are often found at the level nearest to the front end, where they are implemented to return data quickly without taxing downstream levels. How can a cache be used to make your data access faster in our API example? In this case, there are a couple of places you can insert a cache. One option is to insert a cache on your request layer node, as in Figure 8. 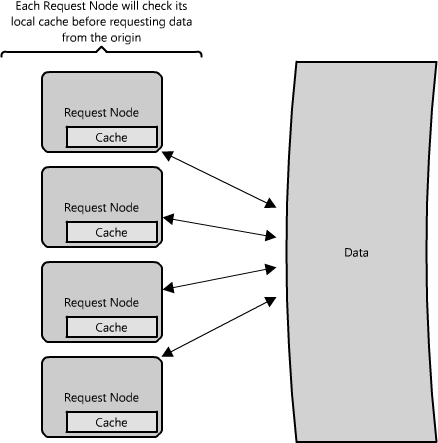 Placing a cache directly on a request layer node enables the local storage of response data. Each time a request is made to the service, the node will quickly return local, cached data if it exists. 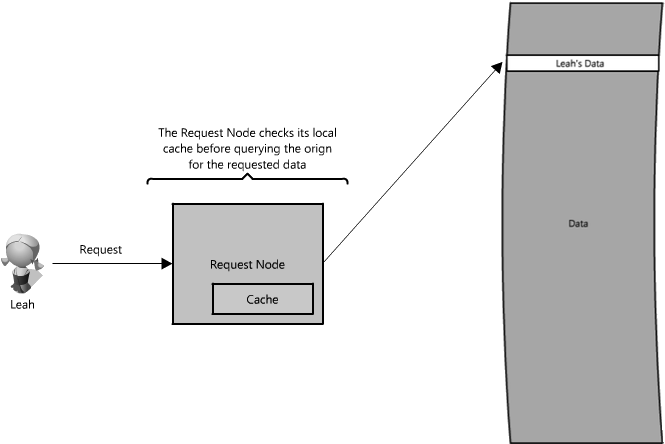 If it is not in the cache, the request node will query the data from disk. The cache on one request layer node could also be located both in memory (which is very fast) and on the node's local disk (faster than going to network storage). What happens when you expand this to many nodes? As you can see in Figure 9, if the request layer is expanded to multiple nodes, it's still quite possible to have each node host its own cache. However, if your load balancer randomly distributes requests across the nodes, the same request will go to different nodes, thus increasing cache misses. Two choices for overcoming this hurdle are global caches and distributed caches. A global cache is just as it sounds: all the nodes use the same single cache space. This involves adding a server, or file store of some sort, faster than your original store and accessible by all the request layer nodes. Each of the request nodes queries the cache in the same way it would a local one. This kind of caching scheme can get a bit complicated because it is very easy to overwhelm a single cache as the number of clients and requests increase, but is very effective in some architectures (particularly ones with specialized hardware that make this global cache very fast, or that have a fixed dataset that needs to be cached).